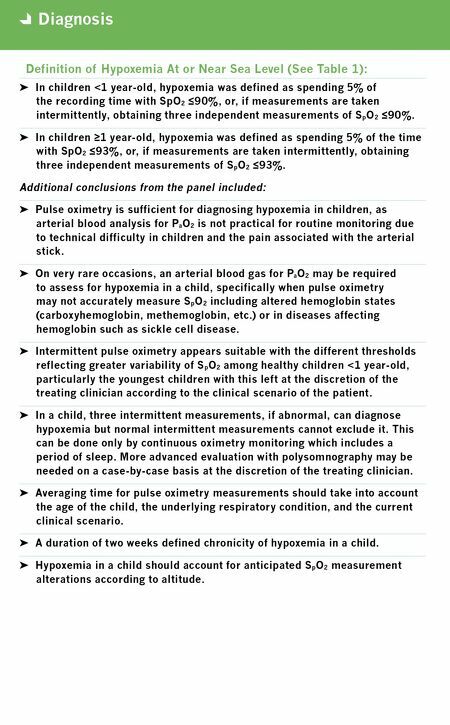 Diagnosis Definition of Hypoxemia At or Near Sea Level (See Table 1): ➤ In children <1 year-old, hypoxemia was defined as spending 5% of the recording time with SpO 2 ≤90%, or, if measurements are taken intermittently, obtaining three independent measurements of S p O 2 ≤90%. ➤ In children ≥1 year-old, hypoxemia was defined as spending 5% of the time with SpO 2 ≤93%, or, if measurements are taken intermittently, obtaining three independent measurements of S p O 2 ≤93%. Additional conclusions from the panel included: ➤ Pulse oximetry is sufficient for diagnosing hypoxemia in children, as arterial blood analysis for P a O 2 is not practical for routine monitoring due to technical difficulty in children and the pain associated with the arterial stick. ➤ On very rare occasions, an arterial blood gas for P a O 2 may be required to assess for hypoxemia in a child, specifically when pulse oximetry may not accurately measure S p O 2 including altered hemoglobin states (carboxyhemoglobin, methemoglobin, etc.) or in diseases affecting hemoglobin such as sickle cell disease. ➤ Intermittent pulse oximetry appears suitable with the different thresholds reflecting greater variability of S p O 2 among healthy children <1 year-old, particularly the youngest children with this left at the discretion of the treating clinician according to the clinical scenario of the patient. ➤ In a child, three intermittent measurements, if abnormal, can diagnose hypoxemia but normal intermittent measurements cannot exclude it. This can be done only by continuous oximetry monitoring which includes a period of sleep. More advanced evaluation with polysomnography may be needed on a case-by-case basis at the discretion of the treating clinician. ➤ Averaging time for pulse oximetry measurements should take into account the age of the child, the underlying respiratory condition, and the current clinical scenario. ➤ A duration of two weeks defined chronicity of hypoxemia in a child. 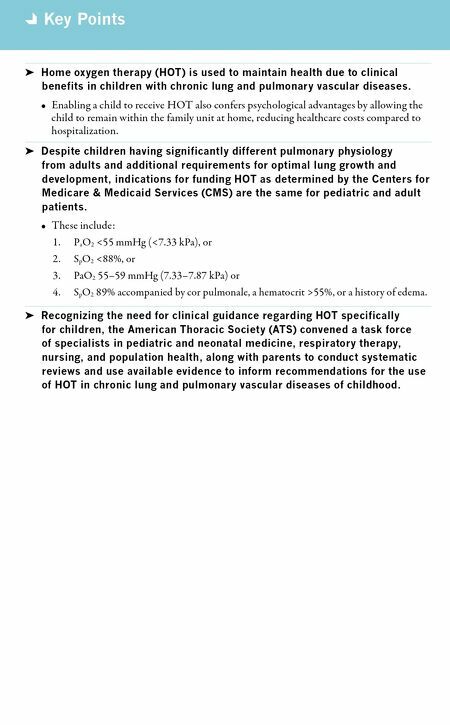 ➤ Hypoxemia in a child should account for anticipated S p O 2 measurement alterations according to altitude.